Wednesday (9/2/09) – Drove To Kentucky – Was heading down to Kentucky with a group of 12 people to do some Houseboating. It will be my first time going on one. The lake we were going down to is called Dale Hollow Lake. Its in Kentucky and Tenessee. Thursday (9/3/09) – First Day On Houseboat – We picked up the house boat around noon at the Wisdom Resort and it is quite a large boat. 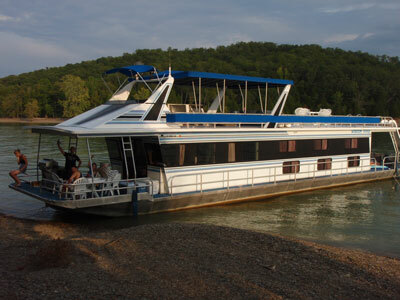 The houseboat is 72 foot long. Its funny to think that the place we got it from just gives over the keys and sends you along your way. It only goes 4 mph so its not like you don’t have time to react. Of course I got sick for the first time in two years this day. My head was just pounding. Friday (9/4/09) – Second Day On Houseboat – What started out as a great day with doing some swimming, jumping off the back of the boat and water slide turned into being one of the most real situations I have ever been apart of. At around midnight my friend was walking down the side of the boat from the back to the front. While coming around he said he got bite by something. When he sat down we could see fang marks. It was a snake. His leg instantly started to swell up and he began puking. We had to call the Tennessee River Valley Authority to come pick him up from our boat and rush him to a dock where a ambulance was waiting. None of us had seen something like this before as Michigan does not have snakes like those. Saturday (9/5/09) – Last Night On Houseboat – I picked up my friend from the hospital in the morning and he was in some pain. He was ok but his leg was a balloon and a little bruised. He decided to come back to the boat and spent the whole day resting. The rest of us went about our activities and enjoyed the rest of the day or so we thought. Around 9pm at night we were hanging out on the top deck playing a game. One of the girls went down to get a couple beers from the coolers. We heard a deafening scream. The snake was back. It appears that it never got off the boat and was hiding under our coolers the whole day while we sat 2 foot from them. 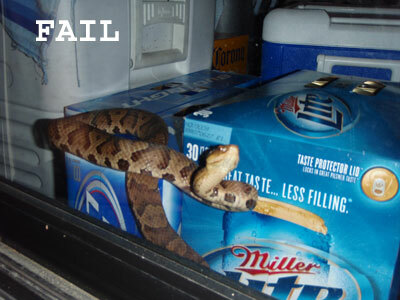 The culprit ended up being a Copperhead. Of course he was hiding right next to the sliding door waiting for one of us to walk through it. Even worse than that was he worked his way in front of our beer coolers. We were stuck inside without our beer as we waited for the Tennessee River Valley Authority again along with the Animal Control. They came back out to our boat again to take care of it. After they got it into a jar the guy who caught it said he has been doing this for 30 years and has never handled one. We were happy when that thing was gone. Sunday (9/6/09) – Drove Back To Michigan – Parked the boat and spent 8 hours driving back. While I was excited for this week to be a relaxing one it ended up being a educational one. The whole experience with the snake made things unforgettable. It leaves a bad memory in a trip that was still a lot of fun.